About the Author. Douglas Crimp is Fanny Knapp Allen Professor of Art History at the University of Rochester. He is the author of On the Museum's Ruins and Melancholia and Moralism: Essays on AIDS and Queer Politics, both published by the MIT Press. 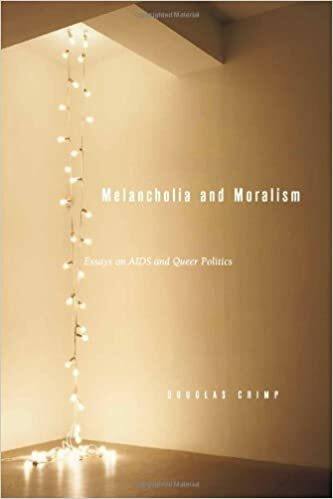 Melancholia and Moralism: Essays on AIDS and Queer Politics | Douglas Crimp | ISBN: 9780262532648 | Kostenloser Versand für alle Bücher mit Versand und Verkauf duch Amazon. looking for someone to write movie review on anthropology asap Aids essay melancholia moralism politics queer. Melancholia and Moralism: Essays on AIDS and Queer Politics von Douglas Crimp beim ZVAB.com - ISBN 10: 0262032953 - ISBN 13: 9780262032957 - MIT Press - 2002 - Hardcover.